Originally launched in October 2010, Instagram has grown to become one of the most popular photo-sharing social networks. It is very mobile-centric, encouraging users to share the photos that they take with their mobile device cameras, particularly smartphones and tablets. Like Twitter and Facebook, Instagram users can "follow" one another, browsing through their respective photo feeds, posting comments and "liking" pictures. Instagram was initially popularized by early adopters and youth, but its appeal has expanded to reach wider demographics, with over over 100 million active users as of July 2013. Although web profiles were introduced in 2012, Instagram is still very much a mobile-focused application. It is currently available for iOS devices like the iPhone and iPad, as well as Android devices like the Samsung Galaxy S4 and the Nexus 7 tablet. As of this writing, it is not available for BlackBerry or Windows phones. Getting started with Instagram is a very easy and straightforward process. Download the free Instagram mobile app. The iOS version can be downloaded from the iTunes Store and the Android version can be downloaded from the Google Play Store. Sign up for an account. The registration process can be completed within the app itself. You will need to provide a username, password and e-mail address. Complete your profile. As with other social media platforms, Instagram has user profiles. Tap the last navigational tab in the app (it looks like a business card), then tap "Edit your profile." From there, you can enter your name and website, provide a profile picture, write a short bio and set your profile as public or private. Follow friends. From the profile tab mentioned above, tap the magnifying glass icon near the top to search for other users that you would like to follow. Alternately, after you log into your account from the web interface on a computer, you can visit any profile page to click on the corresponding "follow" button. Look at pictures. The main feed is accessed by tapping the "home" icon near the bottom. The feed will display all the uploaded content from the profiles that you follow. From here, you can tap the corresponding icon to "like" a picture or to post a comment. Post photos. To upload your own photos, tap the "camera" icon in the middle of the navigational row. You can take a new photo using the Instagram camera or you can select an existing photo from your gallery, as well as other sources like Dropbox. Images can then be cropped and altered, and image filters can be applied. More specific instructions about these features are described in the next section. Post videos. Previously recorded video cannot be imported; it must be shot from within the Instagram interface directly. Switch to video mode after getting into the photo interface by tapping the camcorder button. Video is shot by tapping and holding the record button. When released, the recording will pause. Tap and hold again to continue. You can shoot a continuous video of up to 15 seconds or combine several shorter clips from the same session to form a collage video of up to 15 seconds. As with photos, video filters can be applied. Instagram has many features that allow users to customize their photos and videos. Square pictures: All pictures must have a square aspect ratio. When taking a new photo from within the Instagram camera interface, the preview window defaults to a square aspect ratio. When uploading an existing picture from the gallery, however, the image may need to be cropped to fit the square shape. The crop window can be dragged around the image and the window can be adjusted for size by tapping and holding the nodes on any of the four sides. Image adjustments: After a picture has been taken or selected, the next screen allows users to adjust several of its attributes. There are buttons to rotate the photo, to add or remove the frame, to apply a selective bokeh blurring effect in either circular or linear form, and for automatic contrast and brightness adjustment. Photo filters: Perhaps the most important feature to Instagram are its photo filters. The numerous filters allow users to quickly and easily change the look and feel of their photos, adjusting color temperatures, saturation, brightness and other attributes. Only one filter can be applied to any individual photo. Applying a filter, like X-Pro II is as simple as tapping on its corresponding button in the photo adjustment interface. Hashtags: With each photo uploaded, users are given the opportunity to give it a descriptive caption. Within this caption, users can include hashtags the same way they would on Twitter, prefacing the hashtag text with the # symbol. When tapped in the main feed, users are then shown all other public pictures that have the same hashtag. 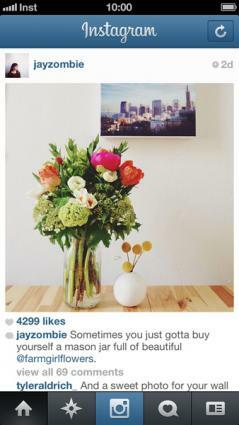 Mentions: Like Twitter and Facebook, Instagram supports the "mentioning" of other Instagram users. To do this in an image caption, start by typing the @ symbol, followed by the username of the Instagram user you'd like to mention. Tagging: Another feature is the ability to "tag" an individual in a picture, the same way you can on Facebook. Tap the "add people" button, then tap the corresponding part of the picture, then choose the appropriate username to tag that individual. Likes: A quick shortcut to "like" any given photo or video in the home feed is to double-tap on the item. Alternatively, you can tap on the heart icon. Comments: Posting a comment is done by tapping on the corresponding comment button and typing normally. Comments support hashtags and user mentions. When uploading a new photo or video, checkboxes are provided on the post description page to share the newly uploaded material directly with these networks. The first time you share with any of these networks, the app will ask for authorization. After new content has been uploaded, the items can be shared by tapping on the button next to the uploaded content and choosing "share" from the provided options. Then, the user can select which platform or app to use to share the item, though this is currently restricted only to content that you have uploaded yourself. Just as there are risks associated with using Facebook and other social networks, there are also a number of security and privacy concerns associated with using Instagram. The site is an open social media platform that can be viewed by anyone. For this reason, some users have decided to make their profiles private rather than public. Anyone can view content uploaded by a user wish a public profile. When a profile is private, only approved "followers" can see the content uploaded by that user. That being said, it is generally recommended that users - even those with private profiles - do not upload any content that they would not want to be seen publicly. At its core, Instagram is still a social network, albeit one with a very heavy focus on the instant sharing of photos and videos. To this end, it is primarily used by individuals to share their life's moments with friends, family and loved ones. Many businesses and brand managers, however, have found that Instagram can also be a hugely valuable marketing tool. Sales can be promoted through it, new products can be showcased, and local events can be highlighted. What can be accomplished with the strategic use of Instagram is only limited by the imagination of its users.